How many times have you gone to make a flourless cake, or macarons, or friands, or granola, only to find that you’ve run out of almond meal? This happened to me a couple of days ago. I got a freebie sachet of quick oats in the mail, and attached to it was a recipe for Strawberry Oat Mini Muffins that I thought would be a great little snack for Miss G, as she’s just started to really eat. I rushed out and bought the strawberries, but I didn’t even bother to check and see if I needed any almond meal. I normally always have it in the cupboard, I use it in all my granolas for an extra bit of goodness and sometimes I use a tiny sprinkling of it over curries instead of slivered almonds. I should’ve checked this time though; I was all out. But I had a 1kg bag of whole almonds staring me in the face, surely it couldn’t be that hard to turn them into almond meal?? Turns out, it’s really really easy. All you need is a food processor or a high powered blender. Or a Thermomix if you have one of those. Oh, and almonds. 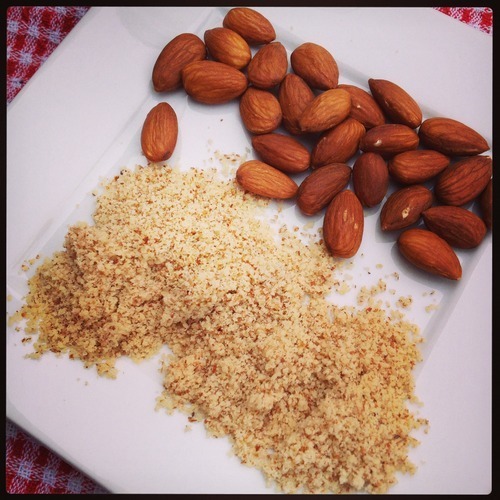 Can’t have almond meal without almonds! It takes a bit of time if you want it to be nice and fine. I think it took me about 15-20 minutes, but it was during Miss G’s dinner time so I’m not 100% sure. I went and sieved mine to separate the meal from the ‘cous-cous’ like bigger pieces, then the bigger pieces went back into the processor to become meal. I did this 3 times, and 2 cups of whole almonds become 2 1/3 cups of fine meal and 1/3 cup of coarse meal. Not too shabby! And don’t throw away the coarse leftover meal, that’ll make a great ice-cream topping or extra texture to your cereal! And it saves a bit of money making it yourself. For instance, whole almonds per kg at my local big name supermarket chain are approximately $16 per kg in its own brand, whilst the meal in the same brand is approximately $33 per kg!! That’s twice the price!! By the way, that’s the whole almonds in a bulk bag. Go for the smaller bags, it’s more like $24 per kg. If you use a lot of almond meal, or eat a gluten-free or Paleo diet, this could save you heaps and heaps of dollars. Place almonds in food processor with chopping blade or blender, and process until almonds are ground to a powder. If your almonds start to clump or don’t go any smaller than ‘cous-cous’ size, stop the machine and sift the meal through a sieve with a rubber spatula. Return the larger leftover pieces to the machine and grind again. 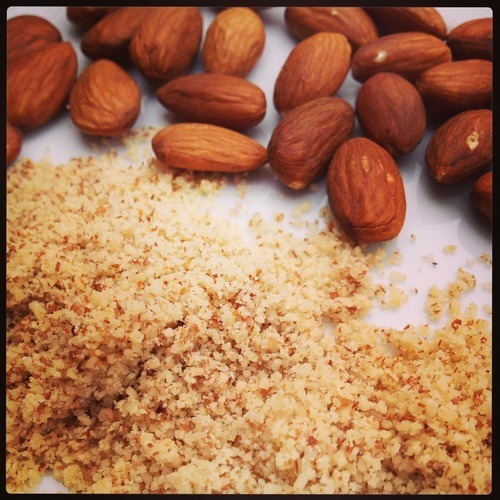 Once made, store your homemade almond meal in the fridge or freezer. Notes: If the almonds start clumping together a lot, you’ll get almond butter rather than almond meal, so keep an eye on your machine. Times differ depending on the size of your almonds and the strength of your machine.